The DOTC throng continues to grow - there be Leopards about. I would like to welcome Sarah Henderson, from Great America, to the fray. Sarah chimes in with some insight around branding. The MPS marketplace is maturing and I see few markets where end users have not been exposed to some form of MPS messaging or offer for a “print assessment”. From the big box stores, IT VARs, Copier Dealers, OEMs, print resellers and office suppliers, there seems to be an MPS offering available on every corner. This places pressure on you to not only build an MPS program, but also brand it in a way that is unique in your marketplace. In the midst of building your MPS program, don’t get in such a hurry you skip over some important considerations for your program roll out and marketing plan. For too many providers of MPS, the program is just one more “add-on” or additional offering to their existing suite of products and services. Too often, this approach is selected because it seems the easiest to implement, which is a whole other story. But in many instances, the core business feels they have too much brand equity in their existing name to market the program separately. Even when you determine your brand equity is strong for your existing business, what are the attributes people associate with your today? 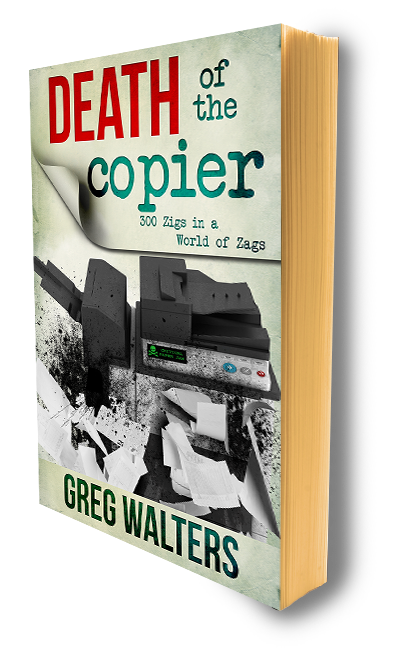 Are you considered a copier dealer, IT consultant, or business process improvement expert? Maybe your equity is residing in a family name that your local customers trust. All of these are valid points to consider, but there is a downside to holding on too tightly to your existing brand position when you add MPS. Consider branding your MPS program as a division or service of your existing business if you feel the equity is there. This will be cleaner and less confusing way to gain some recognition. When you send out your sales team to talk about MPS, make sure you don’t hand over the same old business card of your existing business or direct them to a website that does not include any language about your new program. This may sound elementary, but I have seen sales reps that are fresh out of training make their first few calls with nothing that distinguishes them as an MPS provider. Avoid mixing too many logos or leading with OEM brands, this go-to-market can be confused to your end-user as an oversized fast-food order board. The other option is to focus your brand as 100% MPS. This works well if the existing brand equity you are holding onto will not complement your MPS program, you do not have a lot invested in your current name, your market is already crowded with “hybrids” or you are new business or entrant. When MPS is either rolled out as a separate division or stand-alone company, the brand message should be focused and clear. Many of the companies who choose this approach are also viewed as the “genuine article” in their respective markets. There avoids confusion in the minds of your target audience because as a MPS provider you should not be leading with hardware brands or a brand name associated with your existing business. Be ready to invest the resources necessary to develop the appropriate marketing materials and support a strong promotional mix moving forward. This example reminds me of when fast food giant Hardee’s/Carl Jrs. separated themselves from the pack with the six dollar 100% angus beef burger. Seriously, who would even know that McDonalds has an “angus beef” option on their menu unless like me, you have small kids who love the happy meal toys? Order off the Value Meal? One of the strongest value propositions for end-users is the potential overall cost savings that MPS program can provide. Yet, if your program brand is tied just cost savings or the lowest price, you may want to rethink the long term viability of that brand promise. In most markets, there will be someone who can price the deal “cheaper”. So make sure as your craft your MPS program brand you address the financial sale part of your message with care and consideration of your program goals. While you may provide a low cost entry level MPS solution, you will also want to address your other value-add services that encompass needs within each customer’s environment. Paper wrapper vs. Styrofoam box? Since it is Earth Day April 22, now is a great time to remember the impact of green and sustainability initiatives as a marketing message for MPS. Green benefits of MPS are a real way to address customer pain points and differentiate your marketing efforts. Don’t assume your customer already knows the benefits of remanufactured consumables, implementing recycling, reducing paper use, and deploying newer and more energy efficient equipment. These are just a few pain points you can address in your marketing message. Know your audience and address green initiatives in a specific way through client case studies as you grow your program. Vague claims will not be as powerful that a client testimonial about how your MPS solution reduced their energy consumption. Remember, there is not a one size fits all approach to marketing. Just like Burger King figured out with the classic “Have it your way” campaign, people like to have choice and know your MPS solution is customized to their needs. In addition, you must complete a solid review of your competition currently and in the future. Regardless of your program structure or maturity, make sure you take the time in your business to periodically review your brand positioning, especially as it related to MPS. If this is an area you struggle, please join me for a hands-on branding exercise at “Fundamental MPS Operations – Dealer Workshop – I’m Tired of MPS Seminars” on May 2 in Orlando.